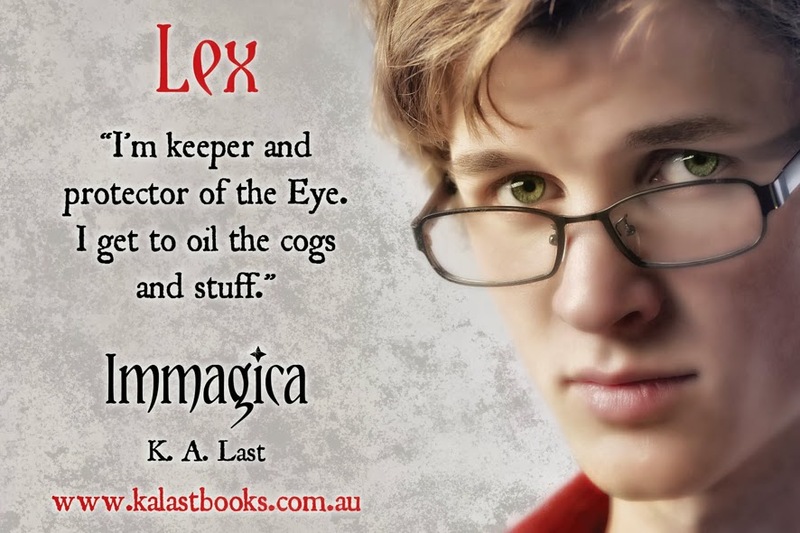 Even though we don’t get to meet Lex until about half way into Immagica, he is quite a complex character. Let’s ask him some questions and see if we can get to know him a little better. KA: Hi, Lex. Thanks for allowing me to come to Immagica to talk to you. KA: Let’s start with something easy. Can you describe yourself in three words? Lex: Um … Quirky? *scratches head* Jittery, and um … loveable? KA: Loveable? I’ll bet there’s a certain girl who would agree with that. KA: From what I’ve seen, Immagica isn’t exactly the sort of place you’d find a McDonald’s drive thru, or your favourite restaurant just around the corner. What do you eat? Lex: Well, actually, I have my own food generator. So I can eat pretty much anything I want. KA: Food generator? Like an automatic vending machine that makes whatever you ask for? That’s like something from a science fiction movie. Lex: Um … *laughs* this is Immagica we’re talking about. Anything is possible. KA: Yes, I guess it is. Do you have a favourite meal? Lex: I don’t usually get the time to think about food, things have been so crazy around here lately. Fruit, I like fruit. KA: Of all the things you could ask for, you choose fruit? Lex: *laughs* Like I said, I’m busy. Apples are easy to eat on the go. KA: At the moment you can’t leave Immagica, but if you could, where in the world would you want to go? Lex: Oh wow, *rubs face* that’s a hard question. It’s been so long I don’t know where I’d want to go. I’ll bet things in the real world have changed a lot since I’ve been gone. Now that Rosaline has helped us, I think I’m pretty happy staying in Immagica. Things have been great since the dragon’s been gone. Lex: Um … yes *blushes* that would be nice, someday. Rosaline changed my life. I guess it would be cool to see where she’s from. KA: Do I detect some romantic feelings in the air? KA: Is there a book you’ve read that’s influenced your life? Lex: *laughs* I’m surrounded by books all day, every day. I think I can safely say that every individual book within the Eye has influenced my life in some way. After all, they’re what I’m here in Immagica to protect. Each story is unique, and has something different to offer in its own special way. Lex: Of course. It’s my job to know everything that’s happened since Immagica was created. KA: Isn’t all that reading time consuming? Lex: Something like that, yes. KA: Is there someone from your past you’d like to apologise to for something? Lex: I try not to think too much about the past. What’s done is done, and you can’t change it. KA: You make it sound like something happened that you’d rather forget. Lex: Possibly. I like moving forward. Looking back only causes pain. KA: What if you had a time machine? Would you go back and change anything? Lex: *purses lips* No, I don’t think I would. Everything happens for a reason, no matter how much it may hurt us. KA: What has been the scariest moment of your life so far? KA: Do you think you’ll venture out of the Eye more now the dragon is gone? Lex: That would definitely be a yes. When the dragon first waged his war on Immagica, I shut myself in so I could protect everything. I’d forgotten what it was like to be outside. KA: Well, thanks to Rosaline, now you know. KA: What’s the first thing you want to do when you go outside today? Lex: The first thing I need to do is some maintenance. One of the clockwork birds went down somewhere near Shadow Crater in The Barren Lands, and has to be recovered. Then I think I might find Ira and Brynn, and see if they want to go for a fly. KA: You’re not afraid of flying then? Lex: *laughs* No. That would be Rosaline. KA: You miss her, don’t you? KA: Okay, now for the fast five. No thinking about these. Favourite colour? Lex: *snorts* Book, of course. KA: Best qualities a person can have? KA: *laughs* City or countryside? Lex: Have you seen my backyard? I’m not even going to answer that. KA: Well, Lex. Thank you for taking the time to chat with me today. Lex: It was fun, thanks. Lex: Say hi to Rosaline for me. KA: Is there a message you’d like me to pass on to her?